For many working adults who are looking to further their education, attending college and going to classes is not a viable option. It’s important that mature students continue to work and earn a living whilst they complete their educational program simultaneously – an option which isn’t often possible with traditional classes and programs at a physical educational institution. This is why many working adults have turned to the internet in order to achieve their education goals. Online learning is increasing rapidly in popularity, thanks to the flexibility and individualization that it offers. 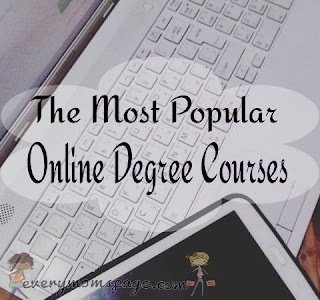 We’ve put together a list of the most popular degree courses which are studied online. As a graphic designer, you will be conveying messages through various forms of visual communication. Graphic design is a popular online degree course for those who wish to work from home or become self-employed as a graphic designer as it is an excellent qualification to have if you’re looking to begin a career as a freelancer or telecommute rather than work in an office. Many businesses also rely on the skills of graphic designers in order to create essential marketing plans. Graphic design courses are offered by a number of credible online educational institutions. All businesses, no matter how large or small, are in need of properly trained accounting professionals to ensure that their finances are properly handled. Both private businesses and government entities must ensure that all employees are paid correctly, accurate records are kept and that all necessary taxes are filed and paid properly and on time. This makes accounting a popular choice of online degree course, as there are great possibilities for employment or promotion after completion. There are a wide range of programs offered online for studying accounting, including bachelor degree programs, master’s degree programs, and a number of different certifications in accounting. The health care industry is always in need of properly trained, skilled and qualified professionals for a number of different career types. Office assistants and managers are highly sought after to ensure that each health care industry is a success. Knowledgeable individuals who understand different billing processes and the appropriate methods of submitting the bills are needed due to increased scrutiny by insurance companies. Health care administration is offered as a course option by many credible online educational institutions. For those who’d like to become an entrepreneur or even those who are already entrepreneurs looking to further their business management and administration skills, this course is a popular option. Offered by credible online educational institutions such as the University of South Dakota online, business management and administration is definitely a course which opens the door to a range of different opportunities. This course will enable you to learn more about how businesses relate to the world and society and provide you with a number of essential problem solving and analyzing skills. Do you study an online course, or have you studied online in the past? We’d love to hear from you in the comments.